The longest serving staff member in the John Miller Burnam Classics Library, Michael Braunlin, has been with the library for 42 years – starting in March 1976. The kind of institutional history and perspective that that brings has prompted me to ask Mike to share some of his experiences with those of us new to UC. Besides being much loved by classics staff, students and faculty alike, Mike has a wonderful sense of dry and even dark humor and a gift for story telling that makes him the perfect interview subject. He is also a true bibliophile and in spite of not being a spinster with cats, glasses and a hair bun, he rather perfectly epitomizes the image of the traditional librarian. 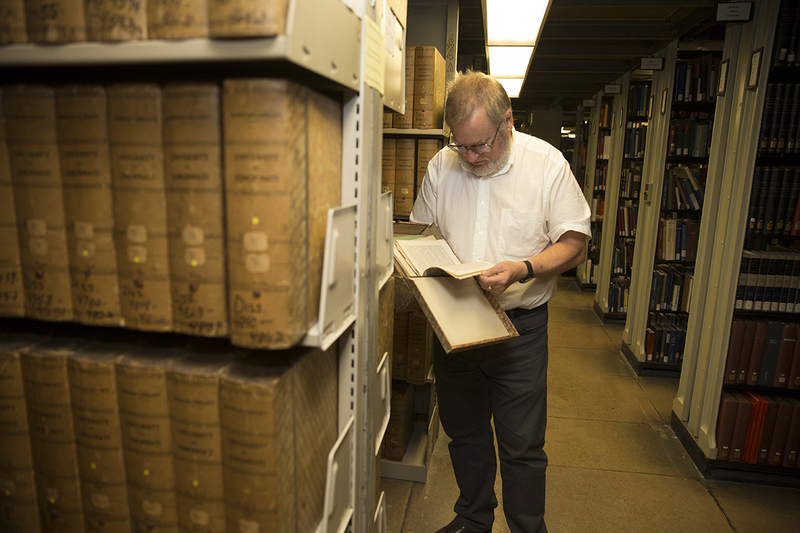 Mike looking at German dissertations in the John Miller Burnam Classics Library stacks. Picture by UC Photography. Mike, where are you from originally? I’m local, or as my detractors put it, loco. With apologies to Virgil’s well-known epitaph, “Miamisburg me genuit”, my hometown, Miamisburg, is a sleepy community just south of Dayton, Ohio. It might now be regarded as a bedroom community, but it’ll always be a sleepy community to me. While it is arguably most famous for being the place where I grew up, it is also known as the former base of Mound Laboratories, which has the dubious distinction of being declared a Superfund site and put on the National Priorities List in 1989. If you are unfamiliar with the National Priorities List, or NPL, as I now know, this is a list of “hotspots” of known or threatened releases of hazardous substances, pollutants, or contaminants throughout the United States and its territories. Also figuring prominently in my youth is one of the two largest conical mounds in Eastern North America, the Miamisburg Mound. A reminder of the ages, it sits majestically across the road from the now abandoned Mound Laboratories. Late one Christmas Eve I climbed to the top of the mound and in the dark, cold silence stared across at the sprawling structure that probably put my little town in the center of a Soviet missile’s bull’s eye during the Cold War. It was a moving juxtaposition of the timeless and the contemporary. The third focal point of my childhood is the Hamburger Wagon. Serving the downtown since 1913, this originally horse drawn contraption still sits on the same corner it has occupied during the 60 years I have known of it. When I was in high school, we used to joke that they still fried the burgers in the same grease they used in 1913, and I bet they still haven’t cleaned out the original pan, still in use after all these years. My older brother used to buy them for me for a nickel. They now tell me they are $1.75. When and how did you come to UC? After taking a BA in Classics from Miami University in 1973, my advisors strongly suggested I apply to UC because it had the best Classics Library in the country. So I applied for the graduate program, and got a Semple Scholarship. Why did you choose to study Classics? In this I am probably one dimensional, and quite a bore to most people. But that’s OK; most people don’t particularly interest me either. But my equally shy wife (who also studied Greek and Latin here at UC, specifically choosing “dead” languages because she wouldn’t be expected to actually talk to people in them) puts up with me, actually likes me, I think, even if she considers my viewing Byzantine coins as aesthetically pleasing objects somewhat queer. When did you start working in the Classics Library? I could never imagine myself as doing anything that wasn’t in some way involved with ancient Greece or Rome. After I graduated from Miami University with a B. A. in Classics in 1973, I came to Cincinnati to enter the graduate program. I was married at the time, and our daughter was to come as a (welcome) surprise in April 1976. At the time, we had little money, no insurance, so I left the Classics PhD program (I thought temporarily, just to pay off the bills) when the vacancy opened for Assistant Head in the Classics Library. Little did I know that gig was to last until I die or retire. I am currently on the fence about which I prefer to come first. 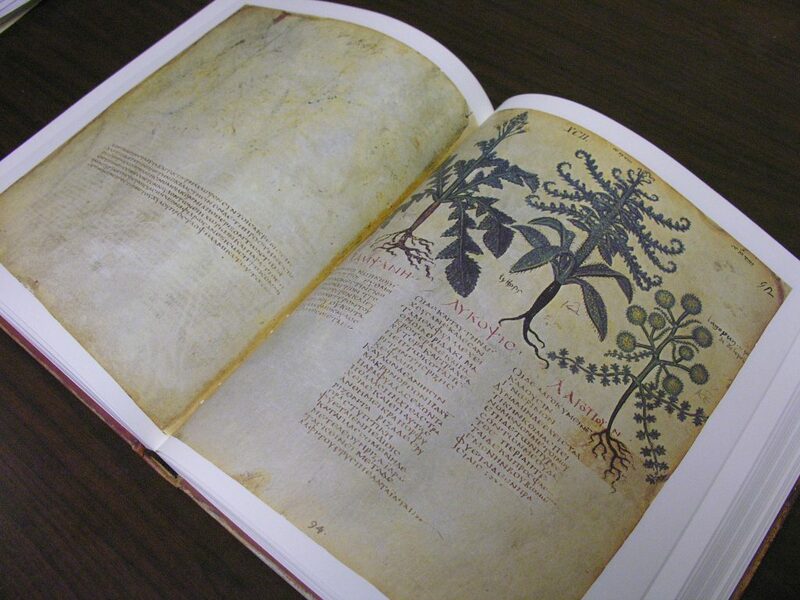 You must have seen many changes throughout the years both in the Classics Library and at UC. Can you recall some of them? 42 years haven proven to me that UC stands for “Under Construction”. RAUCHEN VERBOTEN – thank God! Students and faculty actually smoked in classrooms when I first came here. It was horrid. One of the positive changes to the place. CELLULAR PHONES — and people on them all the time. I first noticed this phenomenon on the Tube in London in the spring and summer of 2001. People were holding these gizmos all the time and silently staring at them as the train hurled itself through the bowels under the City, just as I would meditate upon a miniature portrait of a loved one. It is an aspect of modern life with which I find myself most at odds. I do indeed carry a flip phone, I believe it is called, but I do so to placate my wife, who worries that without it, if I am kicked by my horse at the barn, or shoot myself in the foot at the firing range, I will die alone and un-helped. I used to think that my father’s generation, (he was born in 1890, became a physician in 1911, and died in 1968), witnessed the greatest changes of anyone in history. Dad was born into a world lacking mass communication, automobiles, airplanes, wonder drugs, and over his life was privileged to experience the development of telephones as a common tool, radio, television, air travel, and the wonders of superhighways, penicillin, and atomic warheads. But these were infrastructural advances. I think we have seen more fundamental changes than these in the years since 1970 – changes in the way people learn, think, and communicate with one another. And it is in relation to this last, that I find the greatest disconnect between my interests and that of today’s campus generation. Everywhere I walk on campus, nearly everyone is on a cellular phone – 2 people walking together are at the same time communicating with other parties via the things they hold in their hand. This is like being on a dinner date with one girl, while holding the hand of the young woman at the adjacent table. While this may be fine for some, it is not my way. It seems as if everyone has a phone attached to the palm of their hand by superglue. I walk across campus to my office at 6:50 AM of a weekday; the person walking in front of me is on the phone, talking animatedly to someone. To whom at that hour? At that time of the morning, everyone I know is either asleep, as I too should be, driving to work, or getting kids off to school. And so it goes, everywhere I go. I (and I would capitalize “I” for emphasis, were not the first person personal pronoun in English already capitalized) eschew the notion of being connected all the time. When my cellular phone rings, I cringe. While at work, I must talk with people all day. When I am home, I am grateful to hear little of human voices, save that of my wife, which I must include. I prefer a book on the table to my left, my dog Tetris on my lap, and one of my other 2 dogs in the chair to my right; WE communicate by constant eye contact and smiles. And such communication is enough. COMPUTERS! We had a card catalog in my first years at UC. Many of my contemporaries will also remember them. And a Shelf List – oh, how I miss our Shelf List. The day it went away, I thought our Librarian, Jean Wellington, was going to throw herself between the beloved SL and the movers. When automation began to rear its head in the library – when was it, the early 80s? I no longer remember – what I do remember is attending multiple series of workshops dedicated to ever-changing computer systems having seemingly benign acronyms such as BLIS. There were many others, although this is the only one I can remember. My memory of these events is vague, but I do recall that I would exit the sessions full of despair at having sat through 90 minutes of hearing my native language English being spoken, but at the end of it, not having the faintest understanding of what had been said. I remember my first encounter with a computer mouse. It was not at UC, but occurred while I was visiting a friend one weekend at Indiana University. She showed me a mouse attached to a computer, and I recall my total astonishment of moving this little object which in some way caused things to happen on the computer screen. Younger readers will probably not be able to relate to the impression this made upon me at the time, but I can imagine that the reaction of a pre-Columbian Indian upon seeing the first mounted conquistador could not have been too dissimilar. I do recall that when UC Libraries staff first got computers with mice, we were allowed to play card games to familiarize ourselves with the equipment. There was a time that the Catalog Department must have had 30 full time staff. Acquisitions had 7 or 8. The serials department occupied a huge room full of staff on the third floor of the Blegen building. Over the years, the numbers have dwindled precipitously. STUDENTS AND FACULTY. Initially, the students I served were my contemporaries, or very nearly so. But, mirabile dictu, over the years they have gotten younger and younger. How does this happen? And the same mystery applies to the faculty, which is really weird. When I first arrived here as a grad student and during my few first years as staff, the Blegen building housed not only the Classics Library, but UC’s Main Library. 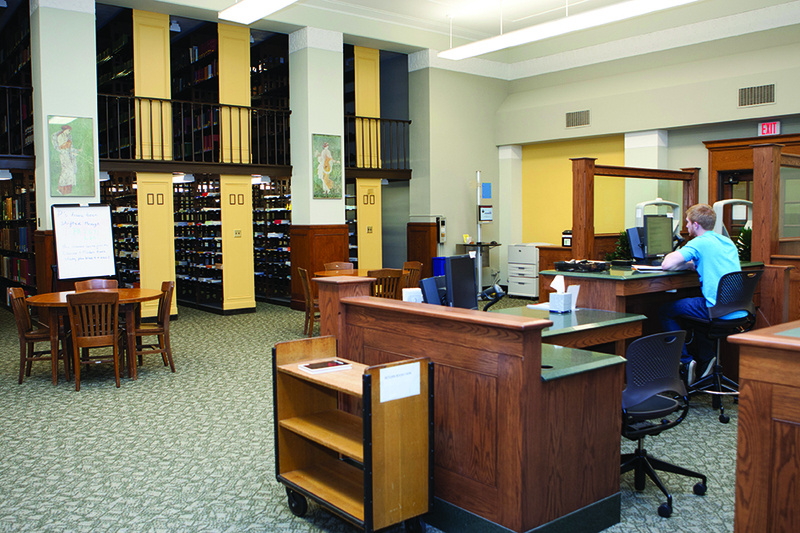 The library’s circulation desk, as I recall, occupied the space where now the Albino Gorno Memorial (CCM) Library circulation desk stands. McBEE CARDS. We used these 3/5” yellow punch cards to circulate books. The borrower wrote the call number, the author/title of the book, and their name and address on the card, which was stamped with the date due. Each card had a series of numbers corresponding to calendar dates that ran along the edge. The appropriate date was punched to correspond to the date due. The card was then filed by call number. To identify overdue books, a thin metal rod was inserted in the appropriate date’s hole, and any cards so punched would drop out of the pile. The call numbers were then searched in the stacks, and any books not found were overdue and notices were mailed to the patron. What about the people – faculty, students, and staff? Who have been some of the more memorable individuals here? As in any story, I suppose, there are the good, the bad, and the ugly. Shall we pass over in silence the latter two? Fortunately, there are very few in the latter two categories. In my years here, many, many people have come and gone, and I am sad to admit that in some cases, I don’t even remember their names. But perhaps at the top of my list I should note possibly the kindest man I have ever met. I’m not even sure of his surname – it may have been Cook, for we all knew him as “Cookie”. Forty years ago he was the building custodian. Cookie was illiterate, the only adult I ever met who had never learned to read. (Although I know some who prefer not to. Shame on them.) But Cookie was a gentleman, a real prince, and I count myself fortunate to have known him. For 40 years I’ve done my best to serve ALL of our patrons. Sort of like that slogan for the Hard Rock Cafe – “Love all, serve all”. My understanding of my Lord Christ’s commands is to love and to serve one another. But service doesn’t come naturally to me. Left to my own devices, I prefer to hang back in the shadows and remove myself from others as much as I can. For the time that I’m in the library each day, I try to push aside this natural tendency, but it goes against the grain, à rebours, perhaps. And the student assistants. In the early days they were nearly the same age as I. We teased each other as contemporaries. Once, in the olden times of typewriters, the students switched my Roman alphabet ball with a Greek one. Because I was not a good typist, I had to watch my fingers on the keyboard, rather than the page being typed. Consequently, I made it through nearly 2 pages before I looked up and saw the mess I had made. My own form of English Karamanlidika! I even married one of them 15 years later. Imagine the scandal that would cause nowadays! But now, I feel for them as if they were my surrogate children. I try to look out for them as I would want someone to do for my own child if she were away at college. Jack Caskey used to keep a pile of Roman and Greek coins in a wooden cigar box in his office desk. We would look through them together during lunch. 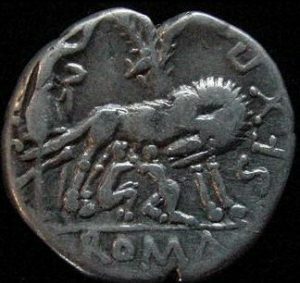 There were many wonderful coins, most of which were from the Troad and struck during the Roman period. We spent many happy hours discussing coins, an interest we shared. In Dec. 1981, Prof. Caskey died of Lou Gehrig’s disease. He was very ill in the last months of his life, so I would come to visit him at his Clifton house, where we discussed life and coins. I had planned to come see him on a Friday night the first week of December. Late that afternoon, his wife Miriam phoned me to say we would have to postpone our visit because he was going to the hospital. I found him at the ER. As he was being wheeled down the hall, Miriam and I walked beside him on opposite sides of the gurney. He and I held hands as we walked. I told him to rest and get some sleep, and that I would visit him tomorrow. He smiled and replied “If I am here tomorrow”. He died that night. It wasn’t until many years after Caskey’s death that I learned of his WW II exploits as Susan Heuck Allen details in her 2011 book Classical spies: American archaeologists with the OSS in World War II Greece (Ann Arbor: University of Michigan Press). The only war story Caskey told me was that in WW II Athens he saved the life of a dog. He was friends with a group of German soldiers who staffed a guard post. They were going to shoot their German shepherd guard dog because it was too aggressive. They were afraid it might get loose and kill a child. Caskey persuaded them to give him the dog; he told me he kept it for 6-7 years and it was the best dog he’d ever had. As he told me, “the best thing I did in WW II was to save a dog’s life”. All in all, over the decades I have come to accept the Classics Department as family. If it is at times, a large, and only rarely, but slightly, dysfunctional, family, like that of the 1980s American television show “Dallas”, nevertheless it is MY family. And I am, perhaps, the poor step-child who is permitted to hang on at the end of the table and who is suffered to sleep in the small room in the attic. Some of the stories you have told me are in my mind too colorful to put into print, but can you recall some interesting anecdotes that can be told? Ghosts – local lore is that the Blegen building has some of them. In the Archives and Rare Books (ARB) Department on the 8th floor, an apparition has been seen over the years. I read once that the Classics Department had its offices in that space years ago, and that the entity might be one of the professors of that time. I can add nothing to this story, but for years I became very uneasy whenever I had to visit our rare books in ARB and I am not usually bothered by such things. In later years, what used to invariably scare me when I retrieved a rare book was the life size photographic image of former UC president Nancy Zimpher that was placed in ARB’s stacks. My reaction to it was very weird. They never moved it (something I would have done regularly), so I knew exactly where I would walk past it; but every time I did, it scared the s**t out of me anew. But the image is now gone, and as I am also entering an age where I may soon number ghosts as my companions, I no longer fear those stacks. Over the years, however, student assistants have told me they are uncomfortable working in stacks 4. No one has ever reported anything extraordinary, but some have told me that something there made them fearful. And when we have had Indian student assistants in the past, many of them would go to great lengths to avoid working in stacks 4. I thought that strange, but an ARB colleague and friend who was from Northern Ireland was not at all surprised. In her view, India and the UK/Ireland were two of the most haunted countries on earth. So I guess they had some experience in these matters. I only experienced one unusual incident and I offer the bare telling of it; I put forth no conclusions. In the late 1970s, an inability to stay asleep often led me to go to the office early – sometimes I was at my desk by 5 AM. One winter morning (some would call it late-middle of the night) I entered the north stairwell to walk down to the second floor, home of the Classics Library in those days. All was dark in the stairwell; the only light was the moonlight that entered the windows. As I was descending in the darkened silence, the entire stairwell suddenly filled with the noise of dozens of people talking and laughing all together. There was no one there, but I was surrounded by sounds of animated conversation. It was as if a cocktail party was going on in full force, spread out up and down through the stairwell. A few moments passed before I realized that what I was experiencing was impossible, but once the reality hit me, I ran up the stairs and continued running out the front door. I went over to the apartment of two of our student assistants, woke them up, and asked if I could stay on their couch until 8 AM. One can make of that what one will; I have no explanation. And then there was the time I was nearly arrested in a case of mistaken identity when trying to catch a The Ohio State University (OSU) student who had stolen some of our books. In the pre-OHIOLINK days, non UC members could not check out our materials. One day a student came to our library to check out books he needed for his class at OSU. We explained he was welcome to read them here, but he could not check them out. So he did the obvious (?) thing – he decided to steal them. He was observed dropping the books out of a window in the stacks (in those days the book stacks had windows to the outside). He then went outside to retrieve the books; the police were called, and Prof. Boulter, who had seen all from his window called me into his office so I could climb out his window to intercept the culprit. By the time I had managed exiting the window and was outside, the visitor was gone, but the police had showed up as I was climbing out of Prof. Boulter’s window and they started to question me. Prof. Boulter called out to the police that I was the good guy, so they let me go, but the bad guy was gone. But not for long. Fortunately he left his syllabus with his name on it behind in the library. Fortunately also he was not too bright. He soon called to say that he was that OSU student who had been using the library and wondered whether he had left his syllabus there. I said, why, yes, I had it safely. Would he want to come back for it? I set up a time for him to come back, when I would give it to him (with the police waiting for him). They got him, and we got our books back. What would you say are some highlights from your professional career? While my non-faculty status never qualified me for a sabbatical, our former Librarian, Jean Wellington, with whom I worked for 30 years, in 2001 arranged with the University of London’s Institute of Classical Studies Library a job switch between one of their staff members and me. Sue Willetts of the ICS staff came to Cincinnati to do my job and live at my house in Madeira. Her perks included the care of our dog Pokie and our pet pig, Georgi. One of my perks was being able to visit the British Museum on my lunch hour. I hope she had fun. I sure did. I will never forget that experience and will always be grateful to Jean for bringing it about. After my return from the UK and a month following that in Greece on holiday, Jean and our Dept. Chair, Brian Rose, then arranged to send me to Greece in 2003 for what we all intended would be the first of an annual book buying trip. For a while I was on cloud nine – an annual Greek book buying trip made my job the best in the world. The succeeding librarian, however, chose not to continue the practice. A LARGE part of my joy in my job died from that time on. Yes, it was a dream come true ended, but dreams, like old men, both eventually die. The chief highlight of my professional career was connected only tangentially with UC. In the early 1980s, the curator of Ancient Art at the Cincinnati Art Museum introduced me to a local businessman and major museum donor, Charles Fleischmann. CF, or Skip, as he was also known, was looking for a curator for his collection of late Roman and Byzantine coins. In 1950 CF was a student at the American School of Classical Studies in Athens. While on a trip to Istanbul (I prefer Constantinople), he missed his return boat, and spent days wandering around the Grand Bazaar where he began buying Byzantine coins. In those days, common Byzantine gold coins could be gotten for $10 or less, while copper coins went for pennies each. Once CF returned to Cincinnati and became settled in the family business he began to purchase important coins from the major dealers of his day. Two images of Rome’s foundation myth of the wolf with Romulus and Remus, the first, from a coin of the 2nd. 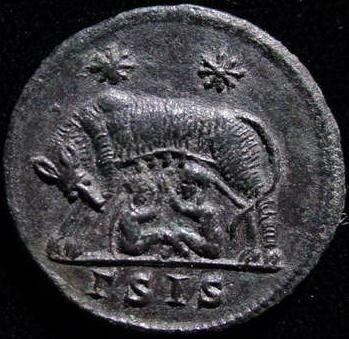 c. B. C.
His collection started with the coinage of Constantine I (306-337 A. D.) and continued through the 4th and 5th centuries. With Roman coinage in the west coming to an end with the collapse of the Roman West in the late 5th century, CF concentrated upon his main passion, the coinage and history of the Eastern Roman Empire, now, perhaps less accurately known as the Byzantine Empire. Once we began our collaboration, we early on decided to discontinue and jettison his 4th and 5th century coins. Instead, we made the new beginning of the Braunlin/Fleischmann Collection, as he always preferred to call it, coincident with the reign of the Eastern Roman emperor Anastasius I (491-518 A. D.). In 498, Anastasius initiated a major currency reform of the copper coinage which formed the basis of “Byzantine” coinage for centuries to come. Prior to my becoming involved with his collection, CF had acquired what coins were available in his day – many examples of the plentiful gold coinage, the occasional silver coin (in the Byzantine series, far scarcer than the gold), and copper coins, readily available, but usually in very poor condition. Although price was of no concern to him, CF’s intent was not to form a spectacular collection of rare coins; education was always his chief goal, and he wanted his collection to be a teaching tool. Because gold coinage would only have circulated to the elite classes, or formed army payments or incentives/bribes to foreign rulers, CF chose to center his interests on the coins that would most have been handled by the common people: the copper issues. Because well preserved Byzantine base metal coins have always been rarer than the gold issues, we set our sights over the years at buying the highest quality copper coins available. Also, because many collections are relatively weak in representation of silver coins, which are also scarcer than their gold counterparts, we chose to strengthen his collection in this regard. As I have done over the decades in selecting books for the Classics Library, CF and I spent 3 fruitful decades building strength upon strength. A representation of the same image from a Roman coin of the 4th c. A. D.
As we began to look for a permanent home for his collection, which would utilize it according to his wishes as an aid to research, our thoughts gravitated to Dumbarton Oaks (DO), located in the Georgetown district of Washington, DC. DO is a premier center for Byzantine Studies, which already possessed one of the world’s finest institutional collections of Byzantine coins. I already had ties to DO through my wife, who had done editorial work for them for years, and through the more family based connection of my step-daughter’s father, who had been a DO fellow. Closer connections were sought; friendships were made, and when my dear friend died in 2011, his Foundation began gifting the collection to DO. I miss CF as I would my own father. He was a dear friend, and his family remains close to me to this day. I was blessed to know him and treasure the many years of memories and our adventures together – both numismatically and bibliographically. What about after working hours? What do you like to do? I like to sleep. A lot. I don’t get much during the week, because I’m always fretting about getting up at 6 AM the next morning. Consequently, I sleep fitfully Sunday – Thursday nights, but relax blissfully until Saturday night, when I start to worry about Sunday night. I read as much as I can. One of my hobbies is reading Chaucer and more recently, the Paston Letters. These are the collected correspondence to and from various members of the Pastons, a Norfolk family, who became prominent as lawyers in 15th England. I’ve no academic training in Middle English, but I’m making headway. One of my favorite authors for a number of years has been A. Edward Newton (1863-1940), who owned an electronic manufacturing concern, but was an avid book collector and who wrote a number of delightful books about his passion for print. I read a lot of scholarship on late Roman and Byzantine coins, but not as much as I should. Several books I hold as “evergreen” – that is, I read them again and again. Some of Chaucer’s tales fall into this category, as do several A. E. Newton books; I also re-read every four or so years Bram Stoker’s Dracula and Steven King’s ‘Salem’s Lot. Although I’ve read no other King save for a few of his short stories, ‘Salem’s Lot abounds in lyrical beauty, and I dig up additional prose gems whenever I dip into it. I also stick my nose into a German translation that reads very well. Guns. I enjoy them, and have a few. But let it be said up front: I DO NOT HUNT. I could NEVER take the life of an animal for fun or sport. Old tin cans, water filled soda bottles, these are wonderful things to shoot at. One of the most cathartic experiences of my life was emptying 50 rounds with one of my assault rifles equipped with a bump stock into an old computer. That took about four seconds to accomplish and the result was quicker and cheaper than an hour in therapy. But I also enjoy old fashioned guns. I have a working reproduction of a 15th c. “handgonne”, examples of which I first saw in a 15th c. Burgundian illuminated manuscript. This gun is so primitive it has no trigger. After black powder and a lead ball are rammed down the barrel the piece is fired by touching a lighted end of rope to a touch hole which sets off the charge. If the bump stock allows 50 rounds to be fired in four seconds, I can get one shot off on the handgonne every three to four minutes! But when we shoot outside at a private range in the woods, we don’t want to scare the animals, so we use silencers. How did your interest in numismatics get started? As a child, I collected Indian Head pennies, but I loved ancient Rome and Greece. Once I went into a coin shop and saw an ancient Roman coin priced at 25 cents. I bought it. The rest is history. However, I am acutely aware of the problems looting and trade in non-provenanced antiquities and coins cause. So just as the smart consumer only buys comestibles that are sustainably and ethically (INTERVIEWERS COMMENT: animal derived and not tested on animals) sourced, so have I added to my modest collection only those objects that have a long pedigree of past ownership. I have a particular delight in the silver coinage of the final decades of the Byzantine Empire, the plentiful, but abysmally struck stavrata of the emperors John V – Constantine XI (1367 – 1453). My wife thinks I am nuts for this, but I find these crude coins, with their near incomprehensible inscriptions and portraiture that a kindergartner could improve upon on a bad day, hauntingly beautiful. Moreover, to behold a diminutive silver coin of Constantine XI, the last Roman emperor, is to survey the transience and vanity of all human endeavor. You have already indicated that you are fond of animals. Could you tell us something about the animals currently in your life and some from your past? I believe God has brought together two disparate species, canids and human primates, to offer us an ongoing example of the love He has for us. 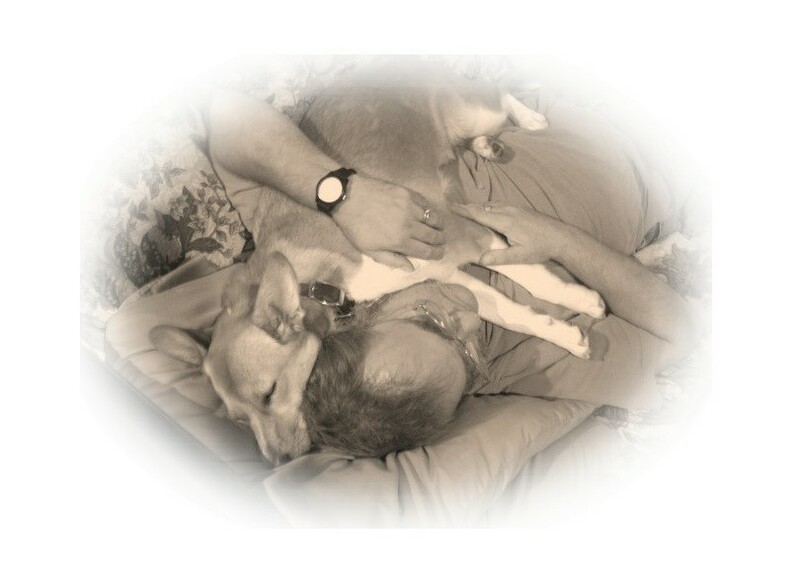 Dogs love us unconditionally, with all of our faults. There are no strings attached to their love; they simply love us – warts and all. I believe God’s love for us is the same. It is freely given, limitless, and unconditional – all we need do is accept it. My three family members who are dogs are named Tetris, Sadie and Daisy. We formerly had a Vietnamese Pot Belly pig named Georgi for 18 years. She was much better house broken than any dog could be. I love them all, but Tetris holds my heart. She is nearing 13 and experiencing the aches and pains of her age – something we increasingly have in common. My selfish hope is that God calls me home before He does her. We also have a sweet horse named Alex. 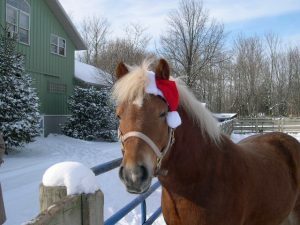 He is a Halflinger, a small draft horse. He is short, only 13.3 hands tall, but is all muscle. I didn’t start riding until I was in my fifties, which is perfectly ridiculous. I have only fallen off once, and that is enough. There is a story to that. As I was starting to fall from Alex, actually it was more like a gentle, uncontrolled slide, my horse desperately tried to adjust his position to keep me in the saddle, but his best efforts were in vain. Down I went, and Homer would have added something about my eating the dust and my armor falling about me. Susan rushed me to the closest hospital, and as the admitting ER nurse was told what had happened, she asked me archly, “Aren’t WE a little old for that sort of thing?” HONEST – THIS IS WHAT SHE SAID! I replied sweetly, and with a restraint as could be expected from a future Elder of the Madeira-Silverwood Presbyterian Church: “A little old? My dear young woman, when I permanently check out of this world, it’s not going to be by any fu**ing boring old person’s accident, like falling in the bath-tub. I want visitors at my funeral whispering in awed tones: ‘Really, he died when the pipe bomb he was making went off too soon? '” The nurse realized she had struck a raw nerve at that point, and why should she not have done? Everything else was raw and aching at that moment. And she left me alone, which was probably best for both parties. I learned from that day that any ride without falling off is a great ride. And last, but by no means least, until our middle daughter Kate recently moved out, we have always had a series of pet rats to complement our household. Rats suffer an entirely undeserved bad reputation. They are wonderful little critters. They are affectionate, inquisitive, playful, a real joy. You are a big Rolling Stones fan. When and how did that start? Although I dearly love Keith Richards, in the early days, it was Brian Jones who received most of the adulation. Brian was a beautiful “cat.” He formed the band that ultimately discarded him. He selected its members. In the early days, he chose the music they played. His prowess as a multi-instrumentalist was unmatched in the rock world. He was an ethereally brilliant star that burned brightly for too short a time. Once called “the dandiest heterosexual of the 20th century”, if he gave nothing else to the world, Brian was the first heterosexual male to start wearing costume jewelry from Saks Fifth Avenue. Today he sleeps in his native Cheltenham. If I live to summer 2019, my daughter Kate and I want to travel to Cheltenham to visit his grave there on the 50th anniversary of his death. What about the future? Dreams and plans you would like to share? The future is in God’s hands. My best friend (apart from my wife Susan, who is REALLY my BEST friend – how blessed it is to be married to one’s best friend) is currently struggling to remain alive long enough be put on a waiting list for a liver transplant. It has not yet been determined whether he is a viable candidate for such a list and I am afraid he may not be. Seeing John’s steady decline has made me aware of how uncertain the future for any of us is. In 1994 this fact also slapped me out of my complacency when I was diagnosed with Hodgkin’s Lymphoma. A year of chemotherapy followed by several years of recovery from said chemotherapy taught me many valuable facts about the fragility of life and the utter waste of any life that is not motivated by love for others and for God. Yet one must anticipate and plan for the future. Just this morning, my daughter bought tickets for her, my granddaughter, and me to see Paul McCartney in June of 2019! And I earlier mentioned that my other daughter wants to visit Brian Jones’ grave in England with me in July 2019. I would also like to visit Greece one last time before I die. There is a lovely village called Limni on Evvia, where we have stayed. It would be wonderful to visit the island again. And I would also like to visit Mystra, which witnessed the last flowering of Byzantine intellectual life in the 14th – 15th centuries. I would also like to spend more time at home, where there are many books yet calling me to read them, tortured Palaeologan coin inscriptions waiting to be deciphered, and dogs who long to sit beside me and stare into my eyes. And also, Susan. Do you have any final thoughts or pieces of advice you would like to share with those new to UC? Only a generalized thought. Work is what one makes of it. I’ve been here for over 40 years because I’ve loved the books, the Classics field, and because I’ve come to love many of my co-workers and patrons. My advice would be: Be kind to one another. That which we all have in common is greater than any differences we perceive separate us. Treat each person you come into contact with as you would want them to treat you. Do that and it’ll all work out.